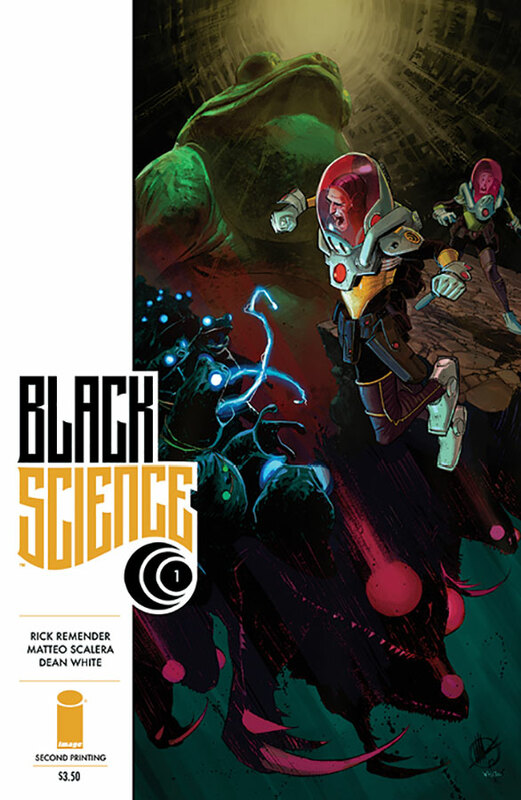 The first issue of the highly anticipated new series BLACK SCIENCE, created by Rick Remender (THE LAST CHRISTMAS, Uncanny Avengers, Captain America) and Matteo Scalera (DEAD BODY ROAD, Indestructible Hulk), has already garnered critical acclaim and sold out instantly at the distributor level. The dimension-hopping begins with a thrilling chase scene and leaves readers with a nail-biting cliffhanger. A former member of The Anarchistic Order of Scientists, Grant McKay has deciphered Black Science and embarked on a journey through an alternate reality with his crew in tow. But he soon encounters none-too-friendly alien worlds and the exploratory mission they all first set out on suddenly a race for survival. BLACK SCIENCE will take readers to the outer edges of reality on a pulse-pounding adventure. BLACK SCIENCE #1 has completely sold out at the distributor level, but may still be available in comic stores, and is currently available digitally on the Image Comics website (imagecomics.com) and the official Image Comics iOS app, as well as on Comixology on the web (comixology.com), iOS, Android, and Google Play. Image Comics is pleased to announce that this first issue will be going back to print to meet customer demand. 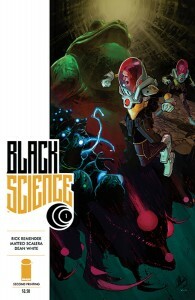 The second printing of BLACK SCIENCE #1 (Diamond Code OCT138205) will release on 1/1. BLACK SCIENCE #2 releases 12/18 and will be available for pre-order with Diamond Code OCT130593. This entry was posted in Columns and tagged BLACK SCIENCE, Captain America, DEAD BODY ROAD, IMAGE COMICS, Indestructible Hulk, matteo scalera, Rick Remender, THE LAST CHRISTMAS, Uncanny Avengers. Bookmark the permalink. Follow any comments here with the RSS feed for this post. Post a comment or leave a trackback: Trackback URL.